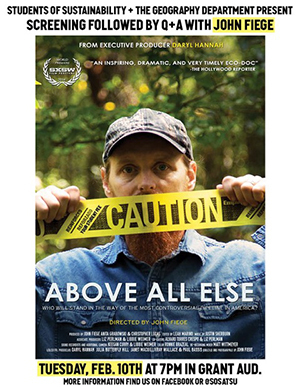 Students of Sustainability (SOS) and the geography department will co-host a screening of the award-winning documentary “Above All Else” on Feb. 10 at 7 p.m. in Grant Auditorium. The free event will be followed by a Q&A session with its critically acclaimed director, John Fiege. “Above All Else” is a feature-length, firsthand account of activists fighting against the Keystone XL oil pipeline. Shot in forests, pastures and living rooms of east rural Texas, this dramatic, eye-opening report begins with one man’s struggle to keep the pipeline off of his land, ultimately inspiring him to rally neighbors and activists alike against the project. Follow David Daniel’s harrowing account of how his small stand turned into the rallying cry of climate protesters everywhere. Fiege is a director, cinematographer and photographer whose films have played at the Cannes Film Festival, SXSW, Museum of Modern Art and Hot Docs, among many others. “Above All Else premiered at the 2014 SXSW Film Festival and won Best North American Documentary at the Global Visions Festival. Variously described as “immersive,” “saturated,” “patient” and “precise,” his distinct cinematic approach translates the political into the personal. Fiege received a B.A. from Carleton College, an M.S. in cultural geography and environmental history from Pennsylvania State University and an M.F.A. in film production from the University of Texas at Austin, where he has also worked as a lecturer.